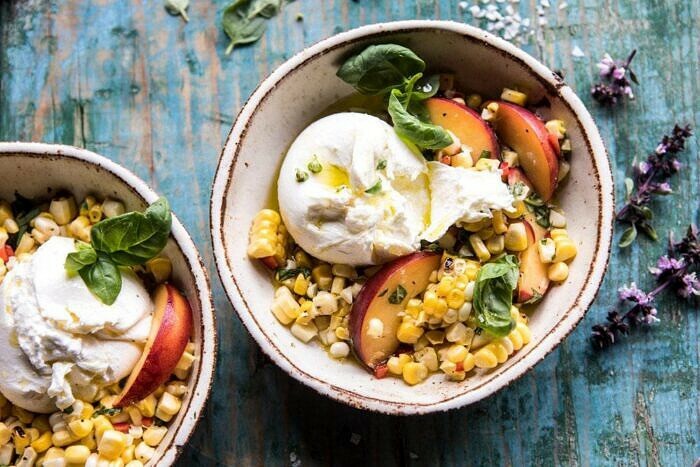 Grilled corn, peppers, fresh basil, sweet peaches, and burrata cheese all come together in this delicious, quick, and easy summer salad. This salad has all the fresh flavors of summer that everyone loves, but with a kick! Plus a ball (or two) of creamy burrata cheese. I like to call it the perfect summer salad, that’s equally great as an appetizer, side dish, or light lunch. This salad might be jumping the gun a bit on summer flavors. I am aware it’s only the end of May, but I figured it’s OK, because Memorial Day is Monday, and a salad like this should be an item on everyone’s upcoming menus. Plus, if I’m being honest, I just really couldn’t wait to share this. It’s so fresh, light, flavorful, and an all-around great warm weather dish. Speaking of warm weather, I am in LA this week for work, and while it’s not quite as hot as I’d like (where are the eighty degree temps?! ), LA is definitely in summertime mode. It’s always fun coming here, and never feels all that much like work. Spending the day in and out of meetings, but hoping to get out into the sunshine for a little bit sometime this afternoon! 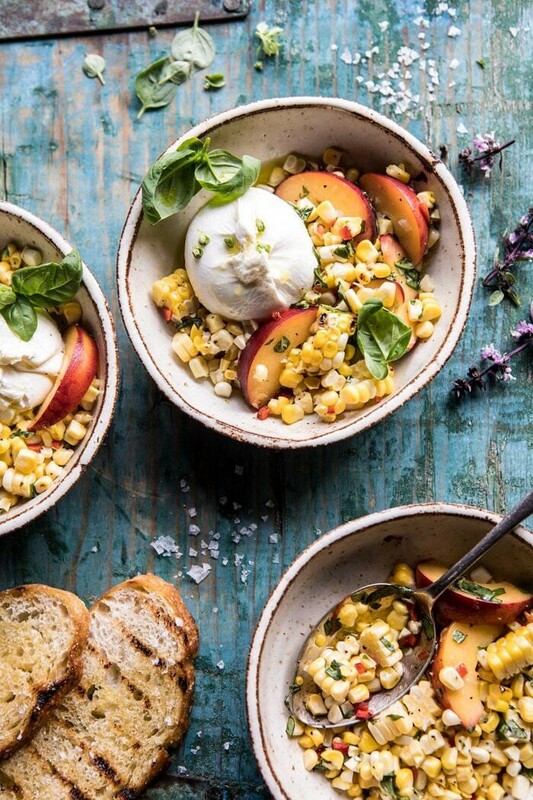 So let’s talk about this spicy corn, peach, and burrata situation. It’s really no secret that I love burrata cheese. For those of you who have not been long time readers, burrata cheese looks just like a ball of fresh mozzarella, but the inside is more like an extra creamy ricotta cheese. If you have yet to try it, you need do so as soon as possible. This is dramatic, but I do think it’s kind of life changing, and you need to experience it. And that’s my burrata cheese cheer. This is one of those recipes that I was never planning on sharing, but after devouring it by the spoonful, I realized it was too good not to share. It’s definitely very early in the peach season, but I found some fresh California peaches at the grocery store the other week and couldn’t help but grab a few. I wasn’t sure how they would taste, but they ended up being so delicious. 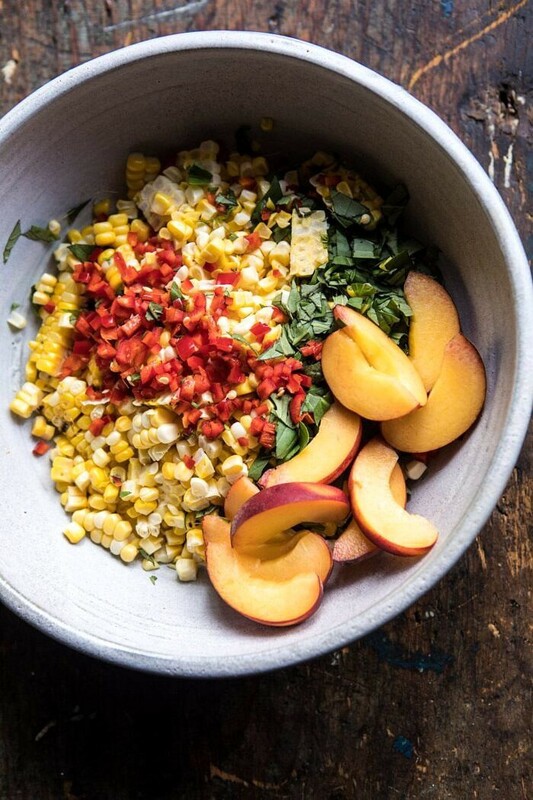 I knew I had a few ears of fresh corn on hand, so I decided to make a simple salad using the corn and peaches and a few other ingredients from my fridge and pantry. It made for the best quick and delicious meal on a boring “computer” day when I wasn’t cooking anything up in the kitchen. Even on days when I am not cooking, my fridge is normally pretty full of food, so I was probably luckier than most to have some fresh ears of corn, a couple of spicy Fresno peppers, lots of basil, lemons, limes, peaches, and I even got really lucky with a ball of fresh burrata cheese. 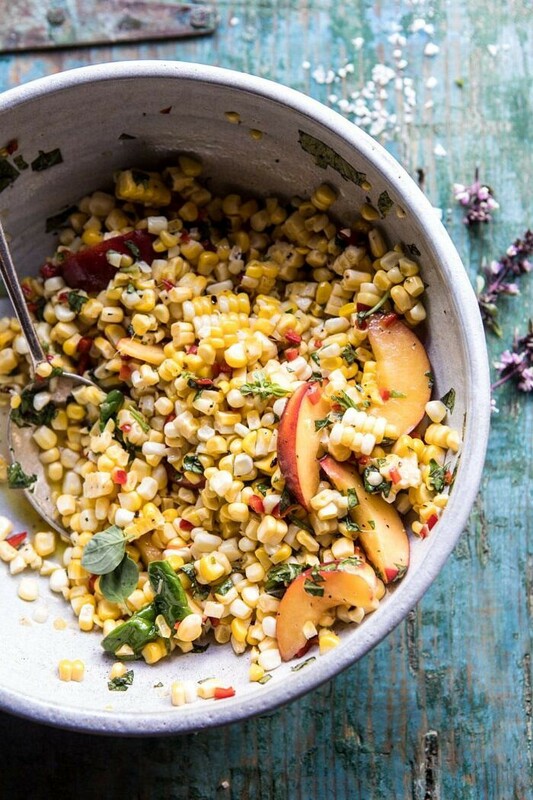 My secret to this salad is simple, grill some of the corn, but leave one ear raw for a nice burst of sweetness with every single bite. 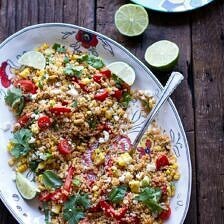 People always seem confused when I use raw corn in recipes, but it’s actually so delicious, and I love mixing it with grilled corn to give a dish a mix of flavors and textures. To balance the sweetness of the corn and peaches, I threw in a couple of spicy red Fresno peppers. I love the kick of heat they add. If you’re not a huge fan of spicy foods, just reduce the amount of peppers to one or however much you feel you can handle. For the herbs and citrus. I used fresh basil and oregano, because those are the herbs that have already started to grow in the green house. Plus, fresh basil is hands down my favorite herb to use in the summer. For the citrusy component, I couldn’t decide between lemons and limes, so I used a little of both and found it to be perfect. Why not use both, you know? As I said, this simple dish comes together really quickly and it’s great both warm or cold. I love serving this with a side of grilled bread for scooping, but I also ended up using the leftovers as a topping for some grilled chicken, which yes, was beyond good. What I really want to stress about this salad is that it’s so much more than a salad. You can serve it as an appetizer with a side of bread, enjoy it as a light lunch, serve it as a topping for grilled chicken, steak, seafood, etc. or even toss it with pasta for a fun pasta dinner. The options are really endless, so have fun with this. And of course, plan to add it to that Memorial Day menu that we have been working on all week (remember Monday’s potato salad?). 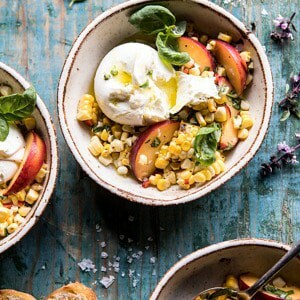 OR be like me, and enjoy this salad for dinner with a generous side of bread for scooping, and an entire ball of burrata…also known as the single girl’s dinner…for those nights when a girl just doesn’t feel much like cookin’. 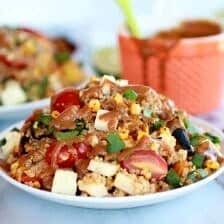 If you make this summer salad, please be sure to leave a comment and/or give this recipe a rating! I love hearing from you guys and always do my best to respond to each and every one of you. Oh, and of course, if you do make this salad, don’t forget to also tag me on Instagram so I can see! Looking through the photos of recipes you all have made is my favorite! 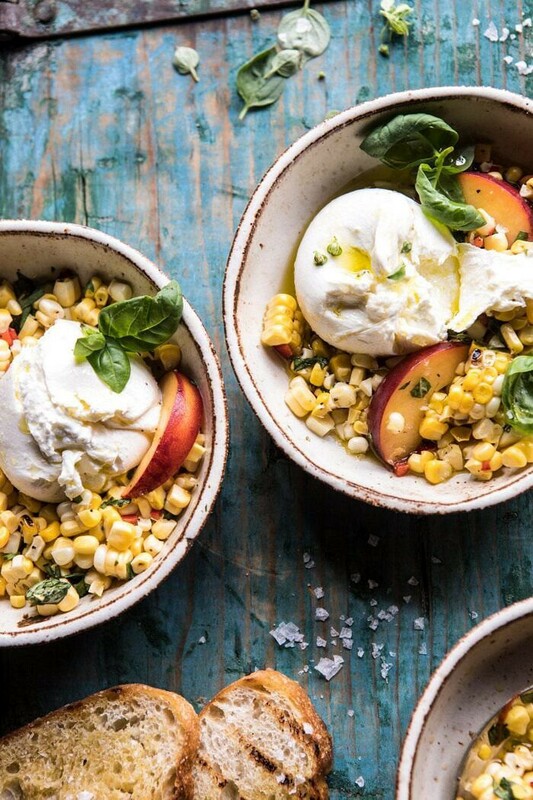 Grilled corn, peppers, fresh basil, sweet peaches, and burrata cheese all come together in this delicious, quick, and easy summer salad. This salad has all the fresh flavors of summer that everyone loves, but with a kick! It's the perfect summer salad, that's equally great as an appetizer, side dish, or light lunch. 1. Preheat the grill or grill pan to high. Grill 3 ears corn, turning every 2-3 minutes until lightly charred all over. Remove from the grill and let sit until cool enough to handle. Remove the kernels and add to the salad bowl. During this same time, remove the kernels from the remaining ear of raw corn and also add to the salad bowl. 2. To the salad bowl, add the olive oil, peppers, basil, oregano, lemon juice and zest, lime juice, and a large pinch of salt. Stir in the peaches. 3. Break the burrata cheese over the salad and drizzle with olive oil. Serve with grilled bread or chips for scooping or as a side salad. I could live on this. 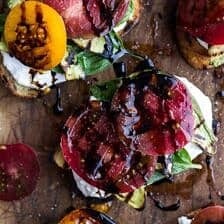 Balsamic Peach Basil Chicken Salad with Crispy Prosciutto. oh yes yes, I could have this for lunch RIGHT NOW!!! You totally should! I hope you love this Ruth! Thank you! Good to know! Thank you so much Danielle! 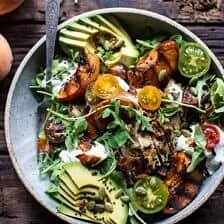 I can’t wait to make this salad this weekend! 🙂 Since I live in a smaller town, our cheese selection is limited at best. If I want burrata, I’ll have to drive about an hour to get some. What other cheese could I use as a substitute in case I don’t want to drive that far? Thanks! I made this last night for dinner. It was amazing with all the different flavors of spicy, sweet, herby, citrus. The texture was amazing and it was such a surprise mix of ingredients. I loved the salad and the peaches and the burrata just put it over the top. Great recipe and so inspiring to see a young chef make her place in the food world! 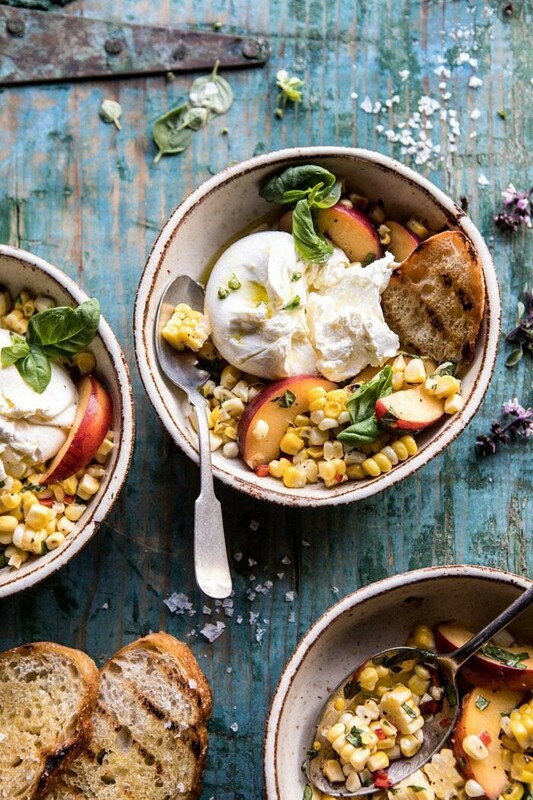 love this, a) because burrata and b) the balance! Sweet, spicy, creamy and savory in one bowl, creative mix, thank you! I am so happy to hear that! Thank you Sabrina! This salad was so easy and so delicious. Made it for a bbq yesterday and it was a huge hit, so simple yet tasty. Thank you so much Ashley! I am so glad you loved this! Thank you Heather! I am so glad you enjoyed this! This is an amazing dinner- thank you! I just LOVE how you are inspired by corn this season. 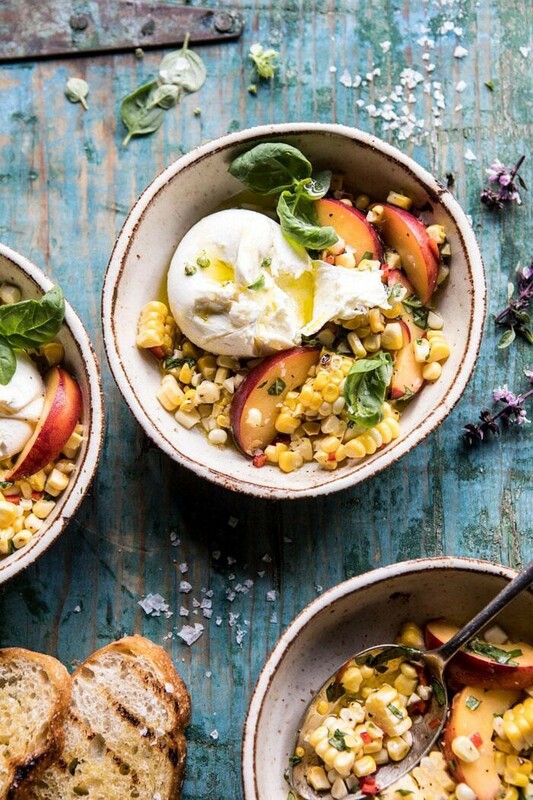 Every time I see you using corn, I get so excited and want to make the dish for dinner. Lol, I even stuffed my freezer with grilled corn just for your recipes 🙂 Wanted to let you know that I made your dish last night, posted the picture on Instagram and linked you! This is so sweet! Thank you so much Nikki! I made this last night after searching for something quick on your site to make for dinner. It was a huge hit! My 5 year old kept saying how it was too good to talk to us over dinner. (lol) I didn’t use any peppers since I was feeding to little kids. So so great. Thank you!! I am so glad you and your family loved this Ashley! Thank you!! I just made this as a side for steak. This was SO DELICIOUS! We couldn’t stop eating it 🙂 Bonus points for being so easy to whip together!